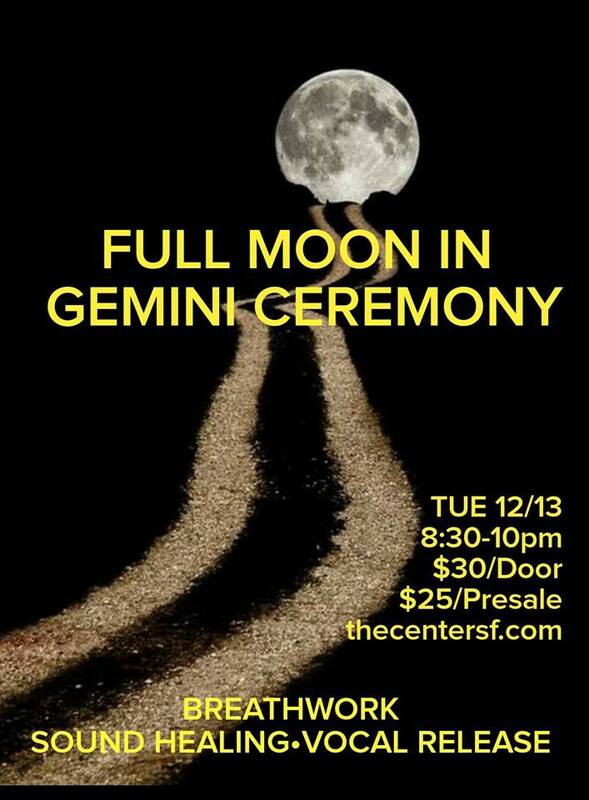 Our Love Tribe gathers each month at The Center SF to celebrate a Full Moon Ceremony. Join us Monday November 14th 8:30-10:00pm. Gathering in ceremony is an ancient ritual that helps us synchronize our human experience with the cycles of nature. The Full Moon is a time to seek healing through balance. It is a time to contemplate what has been supporting our highest path of consciousness, manifest the intentions we set at the New Moon, realize what patterns or beliefs no longer serves us, and let them go! Full Moon energy has its strongest affect on us three days before and up to three days after it is full. This Full Moon is in Gemini. “The Twins” is a Mutable Air sign known as The Artist. Gemini says, “I think”, and the ruling planet is Mercury. Geminis’ flowers are Lily of the Valley & Lavender, and day of the week is Wednesday. Its colors is Yellow and lucky numbers 5 & 9. We invite you to color play with us if it resonates with you by wearing white or yellow.